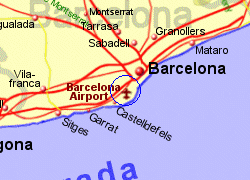 Barcelona Airport is located 10Km South West of Barcelona centre with good access to the C31 and C32 motorways heading into the city or to the Costa Brava further north, and to the south. The airport has two terminal buildings, approximately 4Km apart by road, T1 and T2, the latter being the older building and devided into halls A,B, and C (approximately 200m apart) now used mostly by budget airlines and with limited shopping facilities. 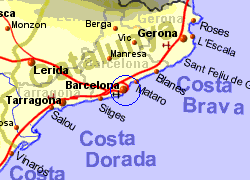 Metro to Barcelona Sants station every 30 mins (jorney time of 20 minutes) approximately €3. 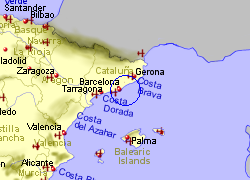 Bus to Barcelona 12 - 13 mins during daytime approximately €5. Taxis to Barcelona approximately €25.